After getting accustomed to the workings and capabilities of a Raspberry Pi, I came up with an idea for my first project: An internet-controllable and/or schedule-automated pet dry food feeder. I did a quick google search and found a similar project with a great write-up by David Bryan, so I started here for reference. First, I need a feeding apparatus. I went with a similar choice as chosen by David Bryan, just a different brand (link). 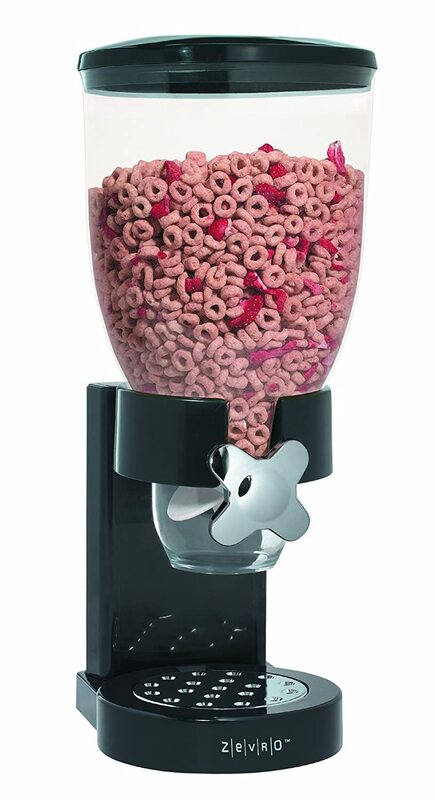 I will be using a cereal (dry food) dispenser with a rotary knob for controlling the amount of food dispensed. I went with a similar servo as mentioned in the previous project as well. The servo will be attached to the knob and run for a designated and calibrated duration of time to dispense the exact amount of food desired. I had a little difficulty finding a way to securely attach the servo to the knob with an anchoring so that the servo itself did not spin. I ended up using a rotary tool to make two scores along the 4 axes of the knob to give the servo arm a ‘grip’ to spin, then some sheet metal used for mounting and guiding the food to the side so that the bowl didn’t have to be exactly under the dispenser nozzle (see photo). Next steps: Setting up the feeder with an RF link from RPi to an arduino board for remote control features and a cleaner set up. Also, video coming soon. I am planning a similar project and was wondering if you had any additional pictures and/or info. I am going with the feeder you used and not the one David Bryan used.